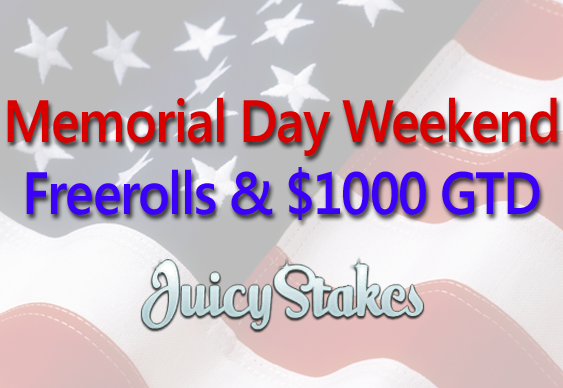 There's a busy weekend of poker in the offing at Juicy Stakes Poker as our cousins across the pond mark Memorial Day. The site is kicking the giveaways off with a $500 freeroll at 11pm today, Thursday 22 May, with a second following at 10pm on Sunday 25 May. Also added to a busy tournament line-up is a special $1,000 rebuy and add-on event at 11pm on Sunday. (all times US Eastern Daylight Time). Seats to the World Series of Poker 2014 are also up for grabs at Juicy Stakes with the next $1500 final scheduled for this Sunday. Feeder qualifiers will be running throughout the weekend.